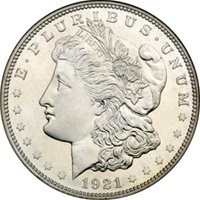 United States Morgan Silver Dollars were minted intermittently between the years of 1878 and 1921. They have a metal fineness of .900 silver for a total silver content of .7734 Today they are one of the most popular collectible coins offered by coin dealers. .